The three major South Korean TV stations will have three new dramas premiere at the same day at the same time, and it’s expected to set off hot new year ratings war. MBC’s The Moon that Embraces the Sun (The Sun and the Moon), KBS2TV’s Wild Romance and SBS’s Take Care of Us, Captain will debut on January 4th, 2012 at the same time slot. For the success of the premiere, three broadcasters have spared no effort in campaigning and promoting the premiere. 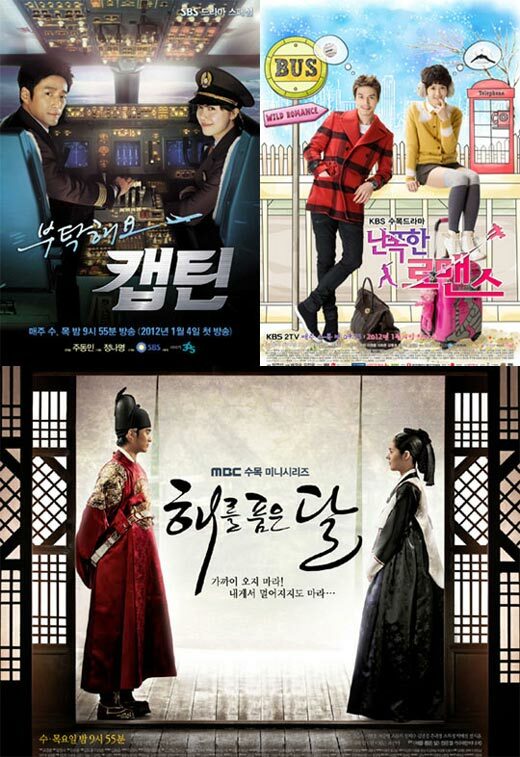 Currently among the three dramas, at atmosphere for The Moon that Embraces the Sun is the best. After the trailer was released, the position of the drama at the search listing surged, popularity is very high. The Moon that Embraces the Sun tells the love story between fictional Joseon Dynasty king and female shaman. Adapted from the best-selling novel of Jung Eun Gwol, coupled with starring by popular actors of Han Ga In, Kim Soo Hyun, Jung Il Woo and others, it combines all the factors that attracts viewers’ attention. But the audience are more concerned about how is historical drama The Moon that Embraces the Sun that combines romance, fantasy and other unique elements will be presented on the small screen. Wild Romance is a romantic comedy based on baseball as material. Lee Dong Wook and Lee Si Young as the lead roles will tell the love story of a professional baseball player and a female bodyguard. The personality of the characters is the core to seize for romantic comedy, in this regard, “short-tempered man” and “violent woman” setting has attracted attention. Meanwhile, SNSD member Jessica involvement in relationship of Lee Dong Wook and Lee Si Yung to form triangular relationship has also induced the audience’s interest. Although Jessica is active as a musical actress, but this is her first time to appear in TV series. It can be expected that her debut in the middle-half segment of the drama will bring more dynamic to the series. Take Care of Us, Captain is a drama that describes the progress of co-pilot on airliner. It’s a new and unique theme similar to The Sun and the Moon. Previously, although there were also dramas related to pilot such as Pilot (1993) and SKy (1995), but it’s reported that Take Care of Us, Captain has invested 800 millions Korean won to set up the filming sets for internal aircraft structure such as cockpit, and also air traffic controller tower, and as such it’s labeled as a comprehensive aviation drama. Take Care of Us, Captain is starring by Ku Hye Sun and Ji Jin Hee. Ku Hye Sun is playing the role of cheerful co-pilot Han Da Jin, while Ji Jin Hee is playing the role of captain who helps her to grow, Kim Yoon Sung. The development of the relationship of hero and heroine has attracted attention.